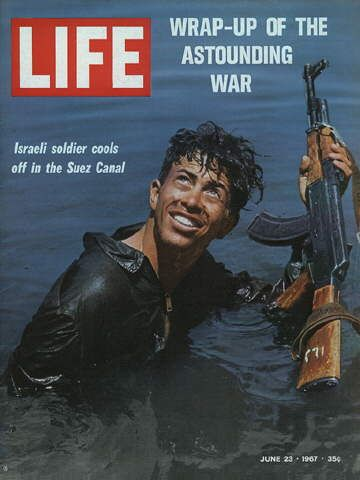 From the 5th until the 7th of June 1967 several Arab countries tried to subdue the young state of Israel, following a large number of events that started unfolding even before Israel’s foundation, 19 years earlier. The military attacks were carried from three sides (Egypt, Jordan and Syria) with plans to encircle Israel and take hold of Jerusalem. Although having United States on its side, The Israeli forces countered the Arab offensive single-handedly. The warfare operations only lasted for six days, but the aftermath gave a whole new dimension to the Arab-Israeli conflict. The Six Day War was the third military confrontation, the first one commencing the second day after Israel’s proclamation of independence. The main cause for all of the Arabs vs. Israelis feuds lies within the territory Israel established its state on in 1948. The religious and historical symbolism of these lands, especially Jerusalem’s, are vital to the beliefs of both Muslim and Jewish religions, each party claiming its own authenticity while fiercely denying the opponent’s. In the early 50s, Egypt installed a shipping blockade over the Suez Canal and the Straits of Tiran for all cargo traveling from and to Israel, culminating with the second Arab-Israeli conflict, the Suez Crisis, in 1956. The fight for water resources continued with Israel building an irrigation canal by deviating some of the debit of the Jordan River and the Syrians responding with the Headwater Diversion Plan aimed specifically to ruin Israel’s irrigation plans. In April 1967, the Israelis conducted an airstrike over Syrian territories and overturned Syria’s intentions. In all this time, tensions on the Jordan border with Israel rose the point when Israel invaded Jordan’s West Bank territory. Given all these facts it is probably incorrect to say that the Six Day War simply erupted. It was only a mere consequence of decades of political instability in the region. Also, it should be noted that besides Israel, Egypt, Syria and Jordan, there were several other states that helped fuel the confrontation. The Soviet Union provided Egypt and Syria with weaponry and instigated the Arabs by providing information (real and fake) about Israel’s intentions. The United States, Israel’s most important defendant, refused to help its ally with military aid, trying to solve the conflict in a diplomatic way. Great Britain and France also chose not to interfere, despite their prior interests in the area. During the war, Israel gained the West Bank territory, also known as Judea – the historical homeland of the Jewish people. After the war, diplomatic efforts to solve the conflict failed at the Khartoum Arab Summit, the same year, when the Arab countries restated their goal – to wipe the state of Israel off the map. Ai reusit sa prezinti obiectiv ce s-a intamplat in acel interval de timp. Conflictul asta e cel mai complex din cate au existat si vor exista si e foarte important sa gaseasca oamenii si informatie obiectiva pentru o mai buna intelegere a ce se intampla acolo. Respect pentru abordarea subiectului.